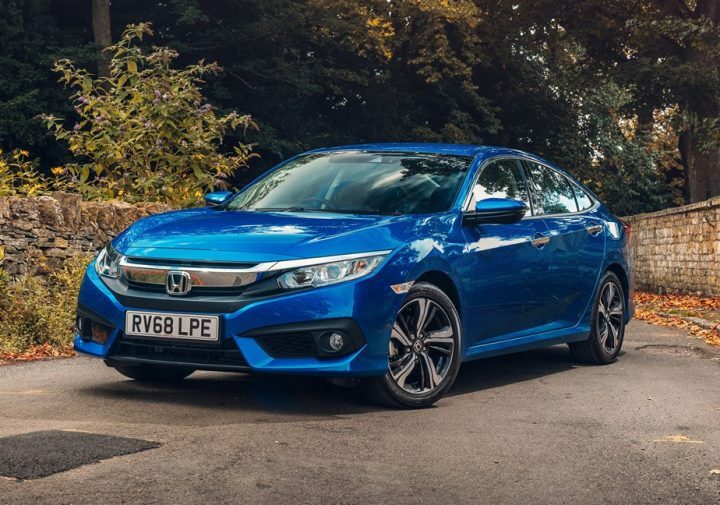 With no Estate version in the tenth generation Honda Civic range, until now only available in five door Hatchback form, now Honda has extended the Civic’s appeal by adding four door Saloon versions, writes David Miles. Unlike the Hatchback and Type R built in the UK for global sales, the Civic Saloon is built in Turkey for European markets. 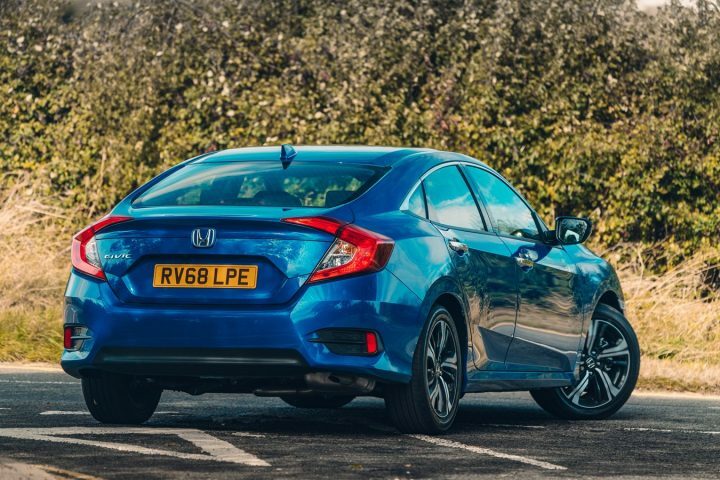 Available with 1.0-litre three cylinder 129hp turbo petrol and 1.6 four cylinder 120hp turbodiesel engines the Civic Saloon has prices ranging from £19,395 to £27,120. 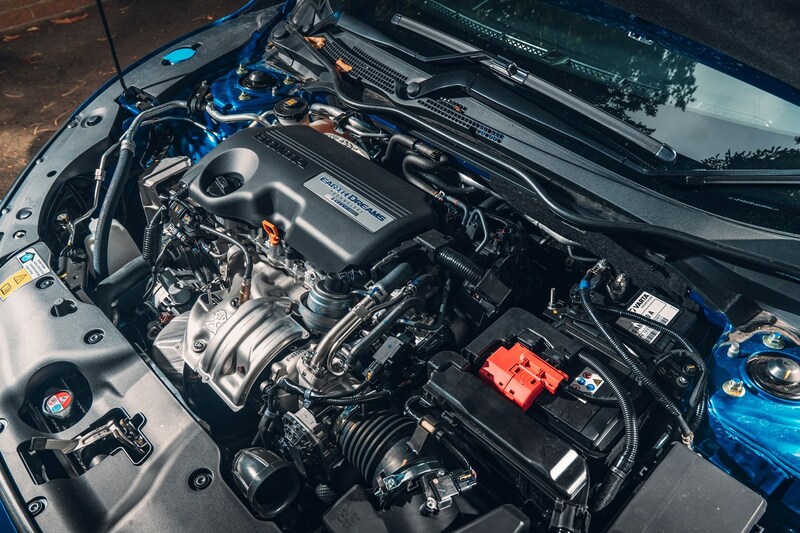 Unlike the Civic Hatchback the 1.5-litre four cylinder turbo 182hp petrol engine is not included in the range reflecting the demand in the fleet/business sales sector, where the Saloon is predominately aimed, for lower emission engines for tax reasons. Civic Hatchback prices for comparable engine and spec levels are £290 less than the new Saloon models. Both engines are available with manual or automatic transmission option. Starting from just 91g/km CO2 for the 1.6 i-DTEC diesel manual can deliver up to 83.1mpg, and the diesel automatic 68.9mpg with CO2 emissions of 108g/km. The 1.0-litre petrol version is relatively clean with 107g/km CO2 for the CVT auto while the manual petrol emits just 110g/km CO2. The petrol engine is also fuel efficient delivering up to 58.9mpg for the manual and 60.1mpg for the CVT auto. Trim levels for now mirror those of the existing mainstream Hatchback model (no Type R version) with SE, SR and EX levels. The entry SE grade comes with Honda SENSING suite of safety features, collision mitigation braking system, forward collision warning, lane keep assist, lane departure warning, road departure mitigation, adaptive cruise control and traffic sign recognition. The SR grade adds rain sensing auto wipers, dual climate control air conditioning, parking sensors and Honda CONNECT (Apple CarPlay and Android Auto) and a rear parking camera. The EX trim further includes leather seats, smart entry and start, LED headlights with washers, LED fog lights, wireless phone charging and heated rear seats. Because the popularity of the SR grade with the Saloon body from the end of this year onwards that will be the only spec level offered with the diesel engine. It currently takes 70% of Civic Saloon sales compared to 44% of Civic Hatchback registrations. When it comes to sales numbers Honda UK do not release such figures other than the UK market is the largest for Honda sales in Europe accounting for 35% of their 100,000 new cars sold in Europe. The current Honda range line up consists of the Jazz supermini, Civic Hatchback/Saloon, HR-V compact SUV, CR-V larger SUV and the NSX supercar. However Honda did say that 80% of Civic Saloon sales will go to corporate buyers (fleet/user-choosers) as opposed to 49% for the Civic Hatchback where 51% are retail sales. Of the two engines on offer for the new Civic Saloon 60% of customers will opt for the new diesel engine as opposed to 40% for the Hatchback. 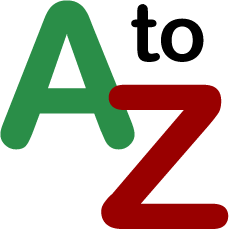 The diesel sales split between manual and auto transmissions is 50/50, similar to the Hatchback. The four door Civic Saloon is almost a mirror image of the Hatchback with both having a steeply raked rear end. 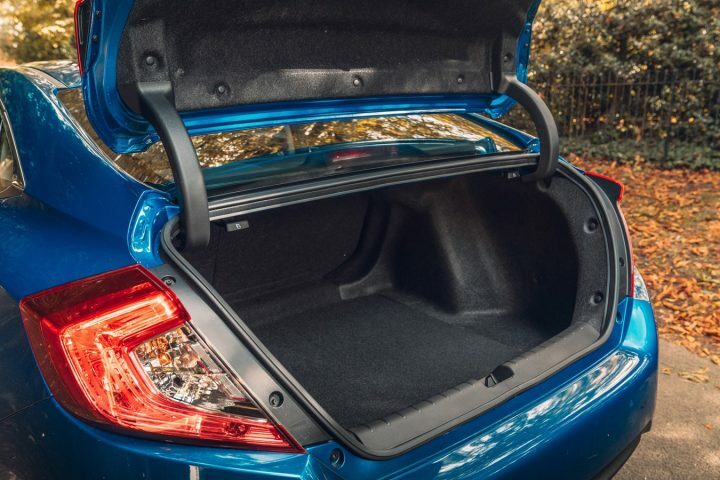 Where the Hatchback has a tailgate the Saloon boot lid is an extended section of the lower tailgate. Both body versions of the Civic utilise a sleek sports coupe side profile with sharply sculptured panels and styling lines. The front wings and rear haunches are bold giving the car a strong muscular stance enhancing the sporting appearance as does the neat boot lid integrated spoiler. Like the Hatchback the Saloon offers lots of rear seat legroom and of particular praise are the seats which are comfortable front and rear. With its 4,648mm of body length the Civic Saloon, like the Hatchback, fits between the traditional C-segment and D-Segment models in terms of length. They are similar in size to say a BMW 3-Series Saloon but longer than a VW Golf Hatchback or Audi A3 Saloon but none of these match the Skoda Octavia Hatchback for rear legroom and boot space. 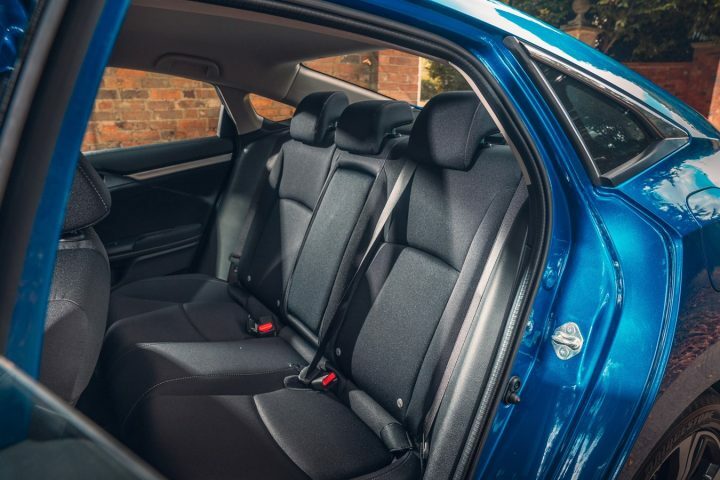 Generally the interior quality and layout of switches and controls of the Civic Saloon is reasonable with areas of hard plastic trim, but it’s an easy and comfortable interior to live with. 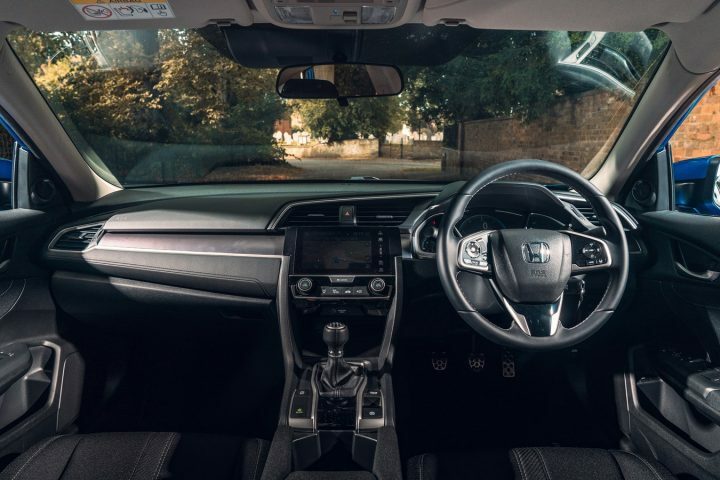 The usual Apple CarPlay and Android Auto connectivity systems available through the Honda CONNECT with Carmin 7 touchscreen navigation serve the busy long distance company car drivers. They will gain most benefit from the Civic Saloon with its new fuel and tax efficient diesel engine. SR spec items of particular note are the 17-inch alloy wheels, dual zone air-con, rear parking camera, front and rear parking sensors, auto lights/wipers power folding and heated door mirrors and halogen front fog lights. The 1.6-litre 120hp power output is relatively modest but the 300Nm of torque at 2,000rpm makes it a responsive unit if full use is made of the gearbox especially as fifth and sixth gears are overdrive ratios to achieve good fuel economy. All those figures are similar to those of the Civic Hatchback diesel I drove recently but in real life driving conditions the Hatchback only returned 55.6mpg. The diesel Saloon for some unknown reason during my recent road test driving, covering local roads and a motorway cruise, returned a much more impressive 71mpg. Robin Roberts adds: You could be forgiven for thinking the Civic hatchback and saloon were unrelated except in name. While sharing the name, powertrain and trim, when it came to dynamics they were very different. Over some typical country roads the Civic Saloon revealed a much smoother character with a less jiggly ride and it coped very well with some deeper potholes and tarmac ridges, and was more compliant and enjoyable as a result. In fact it reminded me of a good Jaguar or Rover but at much, much less cost. You can tell the Honda engineers have set up the Civic Saloon to take on UK roads and it beats them hands down with its straightforward but effective suspension. The smooth ride combined with the gutsy engine, good gearchange, steering and brakes put it ahead of most German rivals which shake their occupants and can be tiring on long journeys. The new Honda Civic Saloon is a class act on the British stage. Against: Noisy engine note under load, reduced choice of spec levels from the end of this year for the Civic Saloon but not the Hatchbacks.